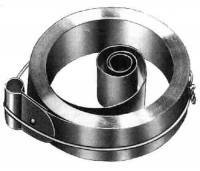 Description: Set of four round wire mainspring clamps hold mainsprings during disassembly. 1-3/8", 1-7/8", 2-3/8" and 3" diameters. Description: Set of four. 2 each of 1-7/8" and 2-3/8". Description: Mainspring winder for loop end mainsprings. Winds springs on the main wheel. 2-3/8" x 3-3/4". Made in India. Description: 3/4" x .0175" x 96" long loop end 8-day mainspring. Made of high grade Japanese steel. Metric equivalent is 19.0mm x 0.44mm x 2438mm. 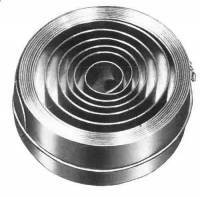 Description: Loop end mainspring measures 3/4" x .0165 x 120". Metric equivalent is 19.0mm x 0.42mm x 3048mm. Description: 3/4" x .0165" x 96" long loop end 8-day mainspring. Made of high grade Japanese steel. The lighter strength offers a more reasonable replacement for American clocks after a complete overhaul. Metric equivalent is 19.0mm x 0.41mm x 2438mm. Description: 11/16" x .0165" x 96" long loop end 8-day mainspring. Made of high grade Japanese steel. Used on many Seth Thomas movements. Metric equivalent is 17.5mm x 0.42mm x 2438mm. Description: Metric equivalent: 19.0 x 0.42 x 1625mm.